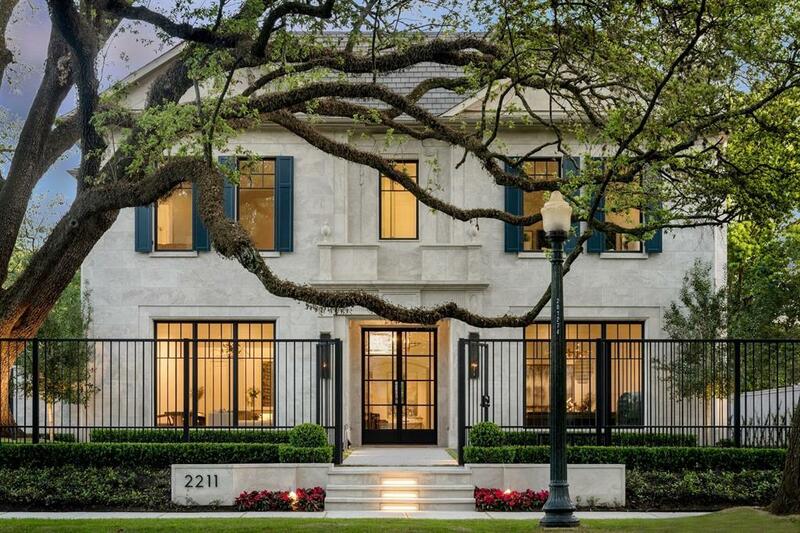 This new home on Inwood Drive in River Oaks is listed for $5.9 million. HOUSTON – (By Michelle Leigh Smith for Realty News Report) – Whisper the name “Inwood” and longtime Houstonians remember as the River Oaks address for the city’s luminaries and leaders like the late George R. Brown, his brother Herman Brown, who lived two doors down, legal giant Leon Jaworski, and Joanne Herring, when she was married to Bob Herring, Chairman of the Board of the old Houston Natural Gas Corporation. The storied mansions of those earlier residents have now made way for new construction, which is experiencing a mini-boom in River Oaks. And Inwood Drive, which runs by the entrance to the exclusive River Oaks Country Club, now has a significant new addition to the home building scene in the River Oaks community. 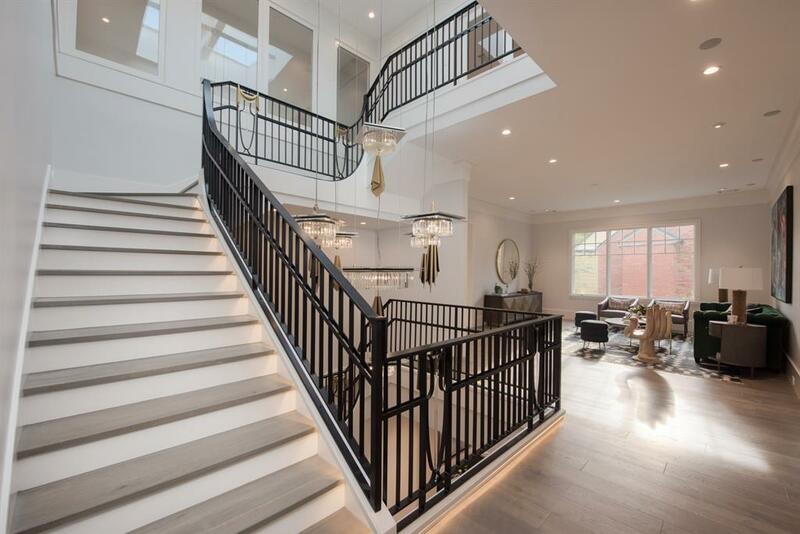 Magnificent staircase in the three-story home. The latest beauty to make her debut sits at 2211 Inwood, priced at a cool $5.9 million, listed by Nancy Almodovar with co-listing by Thomas Eureste. At the recent open house, a red Ferrari bid “Buongiorno” and a pristine white Rolls Royce waited discreetly on the side drive. Montage Builders, a third-generation family-owned development company, built the 4-5 bedroom, 6-bath home with 8,451 SF. Furniture is by High Fashion Home and the interior is illuminated with fascinating nested light fixtures and stacks of Quotation Books that read, for example “Let’s Do What We Love and Do a Lot of It.” – Marc Jacobs and “I’ve Been Cheating on Fashion with Furniture”– Carrie Bradshaw. Look for details like the Master Juice Bar, integrated in the beverage center with Beechwood front wine racks and the Panasonic Ultra Quiet Exhaust Vent Systems. The wine room capacity? A mere 672 bottles. Swimming pool with outdoor kitchen. Even Houstonian Billy Gibbons of ZZ Top would be impressed by the home’s sound system. There are 56 speakers installed throughout the residence, in various audio zones, including the covered patio, pool, game room and Master Dressing Vanity. The Entertainment Room features Dolby Atmos 11.2 Speaker Setup featuring five In-Wall 6.5 Klipsch Bezelless speakers, six in-ceiling Klipsch 4-inch speakers and two Klipsch In-Wall Subwoofers. As drivers turn off Inwood Drive onto the home site, they are met with a pleasing sense of arrival with Basaltino stone driveway pavers, cut and installed to pattern. The landscape and hardscape were designed by Gregory/Henry Landscapes. The stunning swimming pool and outdoor kitchen features a 36-inch Alfresco natural gas grill and white Macaubas Quartz countertops. The pool and spa are illuminated with LED lighting. To top it all off, the Inwood home has three bars: on the first, second and third floors. Cheers!